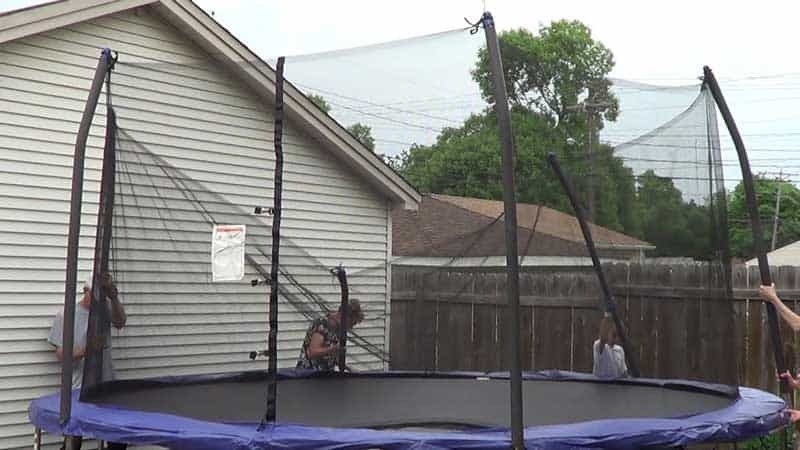 >> How to Put A Net on A Trampoline Easily and Effectively? Trampolines can provide a great amount of fun to kids and to the people who are still kids at heart. But we perceived that most people forget the safety part while they concentrate on the enjoyment and fun part only. Safety should be not only the first but also the most critical concern of trampoline owners. Many people are uninformed that they can purchase trampolines that come along with the safety nets nowadays. The safety nets are crucial as they help in reducing all the risks that are associated with your trampoline. It is obvious that even with the safety nets, your children will not stop trying the dangerous moves. But at least, you can rest assured that the net will keep your child from falling off and getting badly injured. Safety nets are the most common accessories that are used with trampolines in order to prevent any possible accident or fatal injuries to the ones using the trampoline. It is not just for kids, but even adults can sometimes fall off the trampolines. These nets are made up of soft and synthetic materials of high quality. Safety nets are thick enough so that they can last for a really long time. The net is normally set up by making use of the metal poles, which are covered in the sleeves of foam. This net can go around your trampoline, and it can exceed six feet in height. They have been crafted uniquely to prevent individuals from falling off the trampoline and getting hurt. It also prevents the users from hitting the frame, which can lead to a broken bone or laceration. Why Should Safety Nets be Installed? Most of the trampoline accidents take place when the jumpers lose control while trampolining, and they fall off. The trampoline manufacturers ensure that each trampoline kit consists of a safety net in order to make this activity safe. Trampoline safety nets are accessories that you cannot afford to miss. The netting plays a huge role in preventing the rebounders from falling. Almost everyone installs the safety net nowadays, and it has led to the reduction of accidents as well. Falling off from a trampoline can even cause death. To ensure that you and your kids are safe, install the safety net. Ensure that you are zipping up the net whenever it is in use. You should keep in mind that a safety net can never replace your supervision. Supervising over your neighbor's and your kids is equally important to maintain their safety. Though the modern trampolines come with safety nets, if you are on a low budget, you might have to install the net yourself. The first thing that you have to do is assemble the tubes of aluminum or steel and place them together. The tubes can connect to the feet of your trampoline. Few of the poles have notched ends on one side. The smaller tubes have to slide into the larger tubes. Next, the tubes have to be attached to the trampoline’s base. They have to be screwed into the place properly with the help of nuts and bolts. When the tubes stick out like spikes, you have to attach all the balls on top, which will be responsible for holding the webbings in a proper place. After this, you have to take the net, which is a huge rectangular piece and tie it to the base of the poles. Eventually, the net will start spreading out. You have to make sure that you attach the webbing before anything else, or there are chances that the net will not be aligned in a proper manner. Now, you have to tie this netting to poles of the trampoline. The poles should have three knots, and each knot should have loops attached. The loops have to be tied with a square knot. This will ensure that these loops do not become loose even when an over-enthusiastic child plays on your trampoline. The safety nets allow rebounders to stay away from the frame or spring and getting broken bones, fractures and other serious forms of injuries. Hence, installing safety nets is a must. Purchase them separately if they do not come with the trampoline that you have purchased. Nets will take care that rebounders slide slowly and safely down the mat.